A/S/N – Mister, is this right? Always/Sometimes/Never is one of my favorite instructional strategies and one of my weekly do now routines. This strategy can serve a lot of different purposes, and I want to try and keep track of what I’ve used and why I’ve used each problem. So here is my evolving list of A/S/N problems and why I use each one. Note: I have only taught Algebra and Precalculus, so those are most represented here. I hope to add more in the other categories over time, especially as my colleagues play around with this strategy and share their success stories with me. For more examples, see Fawn Nguyen’s blog or math arguments days 324, 325, 326. To connect the solution of “all real numbers” to the answer “always,” and a solution of “no solution” to the answer “never.” Also, as examples of simple algebraic proofs. Mostly to remind students that there are in fact numbers between 0 and 1. To stop and ponder what I believe to be the most common algebra mistake students make. As a counterpoint to the previous example and to establish this identity. To weed out a common misconception. To take away the mystery when these identities come up, which is every once in a while during a derivation or a challenging example. I think testing values really builds the intuition. To prime students for the discovery that y-axis symmetry occurs when all the exponents are even and rotational symmetry occurs when all the exponents are odd. In algebra 1: to ask the question, can you take the square root of a negative number? Why does the calculator say no? In Precalculus: to ask the question, does this property hold for negative numbers? And in doing so, to review complex numbers and assess the class’s current understanding. For flushing out what values make sense as the base of a logarithm and letting students see the need for the precise constraints on this identity. To recognize that the distributive property is a property because it always works, and to raise questions about whether or not these two statements are the same in the context of our study of rational functions and their domains. I love/hate watching students question whether or not the distributive property always works. As a bonus, we prove the second statement (almost) always works by factoring and simplifying. To get students to think about the inverse relationship between quadratics and square roots and about how they are only inverses within a restricted domain. I love when students discover that . To get students wondering and thinking about domains. To get students thinking about what the domain looks like graphically. When we did these two examples in precalculus, we had not yet started trigonometry, but we were able to graph them using desmos. To raise the question, what is the value of ? To get students familiar with what means before we use it in the context of symmetry. The graph of a cubic function has two turns. To get students to grapple with the definition of a “turn,” which I defined as a point where the graph switches from increasing to decreasing or vice versa. Does have 2 turns? What is going on there if it isn’t a turn? Students often find 1 example, but is that the only one that works? To start a conversation about how we can solve equations graphically that we don’t know how to solve algebraically. To tease out the rules for how the signs of the outcomes of integer operations depend upon the signs of the inputs. In my algebra 1 honors class, this raised some interesting discussion about how multiplication (and division) are all or nothing, while addition/subtraction depend on the values of and . To tease out which operations are closed under which operations, which lets students grapple with the definitions and properties of different sets of numbers. The examples with real and complex numbers were a bit over most of my students’ heads, and the modeling examples provoke some neat discussions. Let and be natural numbers. Let and be rational numbers. Let and be irrational numbers. Let and be real numbers. Let and be complex numbers. The sum of two quantities of length is a quantity of length. The product of two quantities of length is a quantity of length. The difference of two quantities of money is a quantity of money. To set the tone for our investigation into angle sum identities. To motivate “proof” as a way to show that a statement is always true. To push for precision of language. Is two points on top of each other a counterexample? How can we change the language to avoid this potential problem? Does adding “distinct” do the trick? 3 points determine a plane. To push for precision of language again. This time, the word “collinear” seems to fix the problem. Also, to make the connection between the geometry of planes and the infinite solutions cases that arise when solving systems of equations in 3-variables. 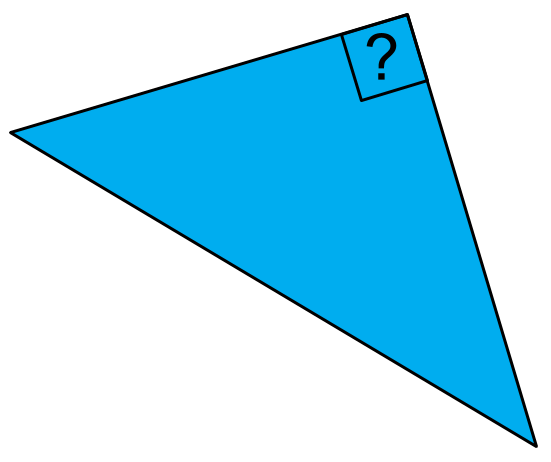 A polygon with three right angles is a triangle. Because I love an excuse to talk about non-Euclidean geometry. To help them remember the important exception.